8/27: MORE Solar Open Houses! On August 27th, check out more Solar Houses, in Lincoln – our Solarize partner! See a couple of solar houses in different configurations up close, and talk to system-owners about maintenance and more. 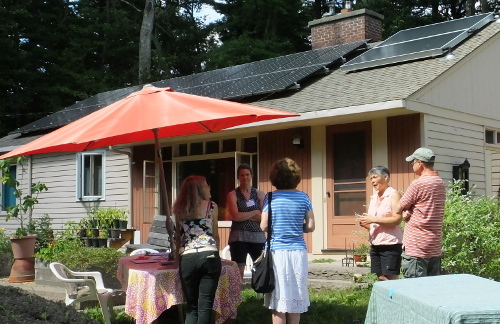 Any Solarize LSW event, including these Open Houses, are open to all residents of Wayland, Lincoln and Sudbury. You can walk in any time. Solar PV and Air Sourced Heat Pumps. From 1-3 PM, the host will show his 10.5 KW solar PV array with micro inverters and Air Sourced Heat Pumps to heat and cool the home. 131 Trapelo Road. Solar PV Leased vs Purchased. From 1-3 PM, the host will show his 18.75 KW system and discuss options of leasing and purchasing solar PV. 53 Stonehedge Road. Solar PV and On Demand Hot Water. From 1-3, the host will show his 8 KW solar PV. Hot water is provided by a Tankless system and a fireplace insert heats the home. 247 Concord Road. Solar PV and Solar Hot Water. From 1-3 PM, the host will show her 6.4 KW solar PV array and Solar Hot Water system. 146 Bedford Road.